This is a joint giveaway with ChildOrganicsand Natural Parents Network. You may enter at one site only. Please find the section marked “Win it!” for the mandatory entry and optional bonus entries. GLOB is offering our readers a paint kit and two bamboo brushes, a value of $24. This includes 6 color packets, 6 compostable jars with lids for mixing, and 2 additional bamboo brushes. GLOB is an eco-friendly company making art time safe and fun. GLOB makes paints from natural and organic fruits, vegetables, and spices that smell amazing. I learned something new about children’s art supplies here in the US and it really bothers me. Arts and crafts paints do not need to list their ingredients on their labels. You know what’s worse? Even those supplies that contain synthetic pigments that have never been tested for toxicity can use the label “non-toxic.” How can that be? I really thought non-toxic meant it had been tested and proved to be safe — well, apparently not. They use the rationale that it’s considered non-toxic because there is no data to prove otherwise. This includes chemicals such as formaldehyde, which is one of the most common arts and crafts preservatives. Ready for some good news? There are great companies out there that are working to change the standard of quality in the arts and crafts industry. GLOB Eco Arts and Crafts is doing something different. It is a company founded by Ashley Phelps who is an artist with sensitivities to chemicals. She set on a mission to create her own paints using natural and organic fruits, vegetables, and spices. My personal favorite about the products is the use of organic aromatic compounds. This makes the products smell good enough to eat! 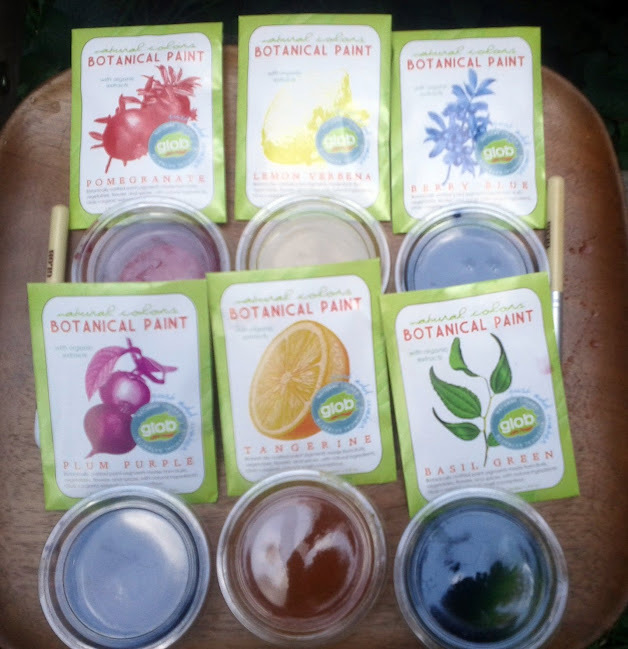 They take natural sources of beautiful colors such as basil green and tangerine orange and make them into a powder. You simply add a little bit of water and, voila, you have your eco-friendly paint. They work on paper more like a water color than an acrylic or tempera paint. The colors are beautifully natural. I think the GLOB It On art materials do a great job of providing fantastic stimuli for your budding artistic geniuses. These paints would be excellent in a Montessori setting. They really encourage the full use of your senses, including sight and smell. GLOB really takes eco-consciousness seriously. They provide high quality art brushes and paints that really are safe for your children to use. We first tried them out as paints, using watercolor paper and the bamboo brushes supplied. The kids had fun getting creative. 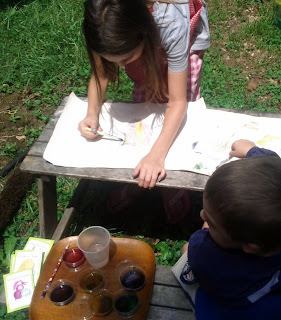 After painting with them, we tried to use the paints as a wood stain on the kids’ picnic table. The color was very light and didn’t show up very strong as a wood stain. Perhaps I should have mixed it stronger. Our favorite way that we used the GLOB paint kit was in making play dough. GLOB has activities and recipes on their website. I didn’t have cream of tartar as their recipe calls for, so I used a different play dough recipe with great success. 1. Combine flour and salt in mixer. 2. Add coconut oil and water. You can mix the paint packets with the water if you are making one batch of a solid color. 3. Remove dough from bowl, knead on surface, and add paint to dough. Knead until color is mixed thoroughly. Store in an airtight container. The play dough smells fruity and fresh. The colors are more of a pastel. The kids are having a great time playing ice cream shop with their play dough creations. So, as you can see, GLOB paint kits are very versatile … and did I mention they smell soo good! GLOB is a company that puts their money where their mouth is. They are dedicated to bringing safe, natural craft products to schools. Each year they do a School Giveaway and provide free paints and green art supplies for art programs. You can learn more about their efforts here: http://www.globiton.com/schools/index.htmlThey work with a grant from Eilieen Fisher’s Woman Entrepreneurs Business Grant Program. This grant has enabled Ashley’s company to expand not only nationwide, but worldwide. For your own chance to win a Botanical Paint Kit from GLOB, enter by leaving a comment and using our Rafflecopter system below. The winner will receive a GLOB paint kit and two additional bamboo brushes. This includes 6 color packets, 6 compostable jars with lids and a total of 4 bamboo brushes in a rice paper pouch. Contest is open to US residents only. MANDATORY ENTRY: Visit GLOB and tell us what GLOB products your kids would love best! You must enter your name and email address in the Rafflecopter entry system for your entry to count, after leaving a comment on this blog post. This is a joint giveaway with ChildOrganics and Natural Parents Network. You may enter at one site only, and we’ll be recording IP addresses to ensure that there are no duplicate entries. That said, please do visit and enjoy both sites! Contest closes September 22 at 11:59 p.m. Eastern Time. Erica is a homeschooling parent who blogs at ChildOrganics. She’s very passionate about living a green, eco-friendly lifestyle. She loves spending time outdoors and getting creative with her family. i like the bamboo brushes. The keepsake bags are so pretty! I would paint with my kids. Love the keepsake bags and bamboo brushes. My 3 and 5.5 year old daughter would love this! I really love the Plantable Collage Kit. I will enjoy this with my toddler and on my own! Oh my! I love this! I’ve been looking for a truly safe paint for my daughter for ages. She tends to get it everywhere and I just know toxins aren’t sitting on the surface of her skin for me to wash off. They’re going into her blood stream, kidneys, and liver. I think I’d like the coloring illustrations. My son and myself would enjoy this paint kit. I also like the Collage Kit with Seeded Paper! My daughter and nieces would enjoy this paint!